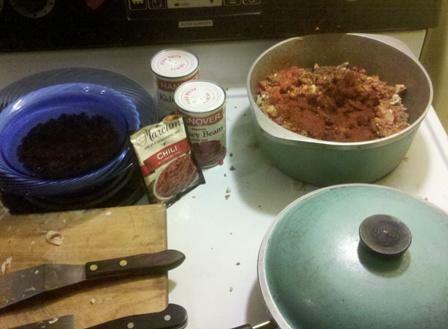 I threw in what I had in the house - garlic, onions, some beans, tomato sauce, chili powder, meat, and what I got at the local grocery store - more beans, and pepperoni. 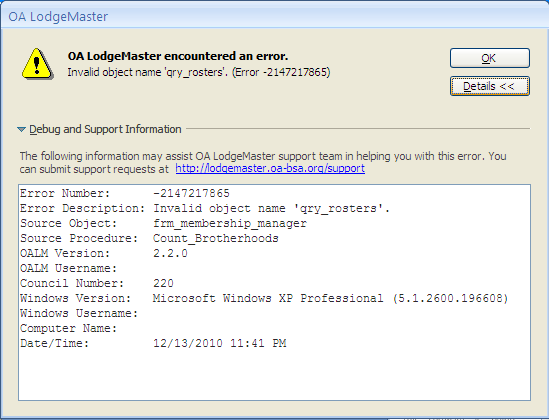 The Order of the Arrow membership database system is called LodgeMaster, also known as "OALM" once you've said "Order of the Arrow Lodge Master" too many times. I tried out the client / server set up for practice. It works, but there are things to be aware of. Below are many screen shots; I'll talk about them in this beginning text. Image (1) show what the server screen looks like, once you've switched on the feature. 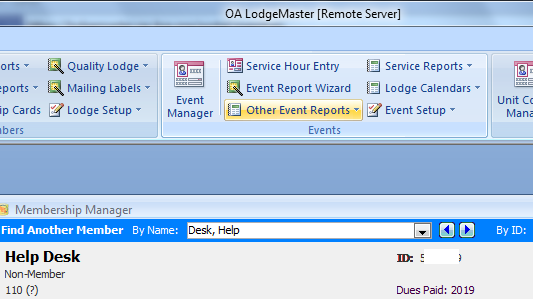 I am not showing the setup screen, but there is a key that is generated which each client will need to enter to connect. Image (2) shows what a client looks like, after connecting. 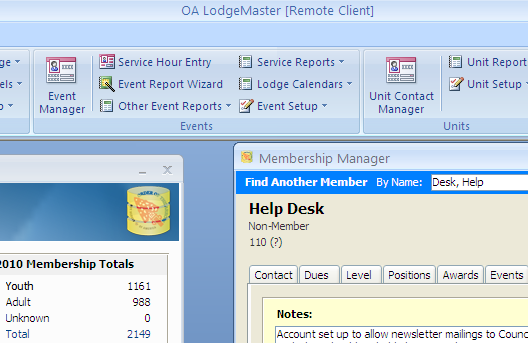 While the client machine will still have a database running, user screens will be connected to the database on the remote server. Since clients will use one central database, rather than the distributed databases, I would make sure no client machines enter data except in the server/client connection during an event. Otherwise, no new or changed records on the client machine will be visible to anyone else until after all have synchronized later. Images (3) and (4) show the error messages if a client machine does not have the server's IP address and current key (which changes on each open and close of the server). So what about synchronization? Neither the server nor the clients can synchronize to the central database (in the cloud) while either are running remotely. See image (5). Because "all the eggs are in one basket", I would recommend trying take check points during the event, such as late night, early morning, or maybe mid-day. 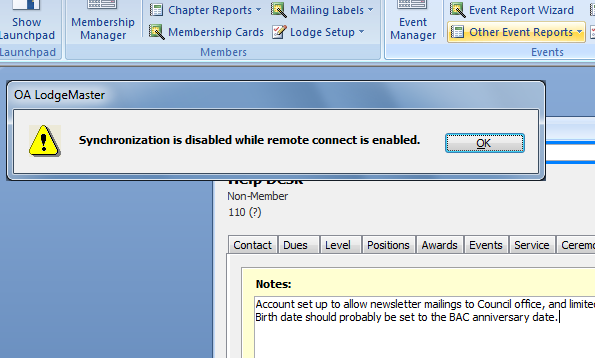 All clients need to disconnect, the remote server needs to be switched to normal mode, then synchronization started. That way, all is not lost should that machine crash, especially since the clients databases have no records of any entries during their remote access time. Image (6) shows what happens when the server goes back to normal mode. Most of the remainder of the images were recorded during test scenarios where I shut down either the internet connection, the server, or crashed the client process to see how the client/server behaves. 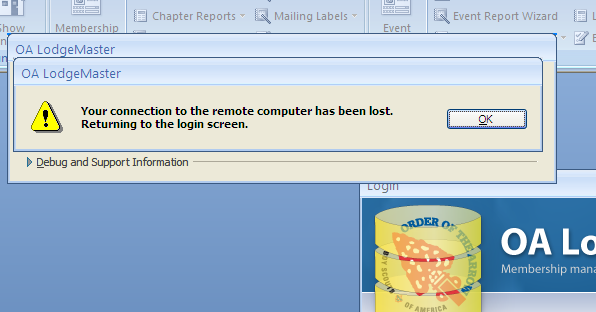 Unfortunately, while one message claims "returning to logon screen" I was never able to re-connect a client process once the linkage dropped. Stopping the client SQLServer process did nothing to restore a live connection; the MSACCESS process apparently manages the menu screens. 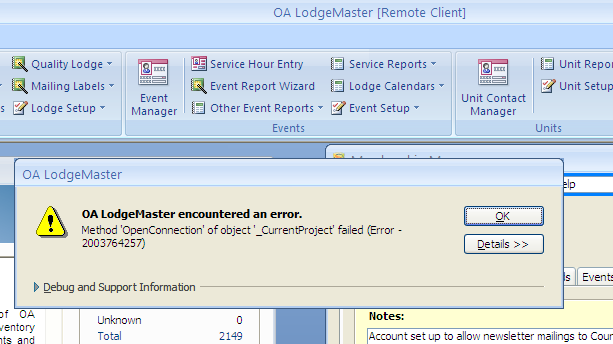 That makes sense once you realize the client connects to the SQLServer database on the remote machine. If the remote server is stopped and started again, a new key is generated, meaning each client will need to start up again with that key. Some of the error messages are not connection-related, but due to bugs in OALM or Microsoft software. 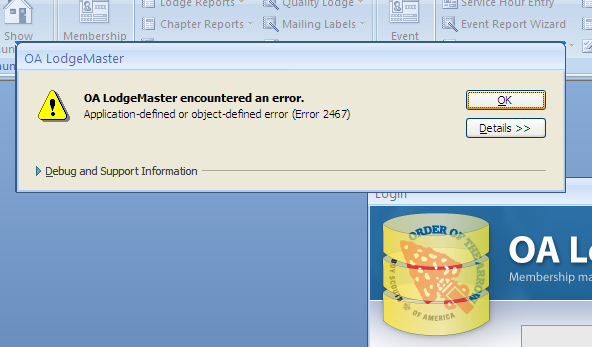 "Invalid object names" seem to be due to broken records inside the database. 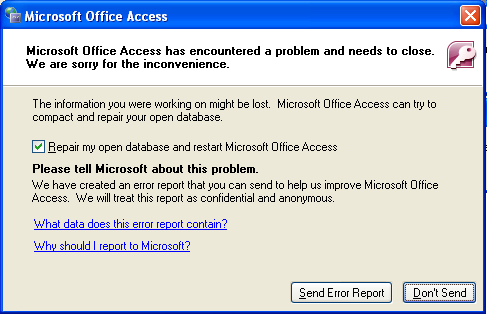 The "Microsoft Office Access has encountered an error" could be due to a bad call, or just general bugginess. Business as usual in the software world. Despite these test results, I didn't lose any data or need to reboot either system. Given this will be used in a field situation, with lines of people sometimes waiting for check-in, it's important to practice under adverse conditions to anticipate and avoid problems. Motto of the Scouts, right? 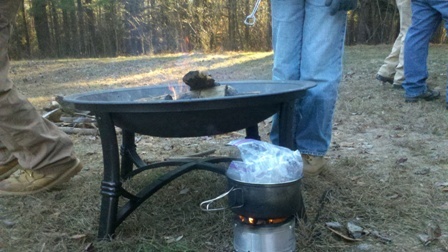 The troop camped at Broad Creek this weekend, where lows on Saturday morning were around 26 degrees F. To get the cheerfulness going, we had a small wood fire, in a commercially available fire pan. 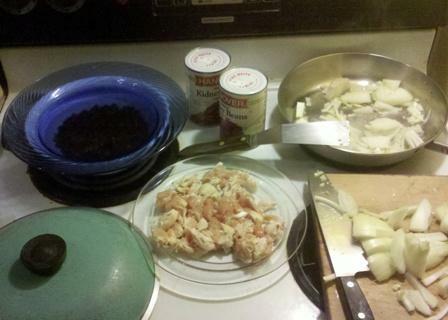 We didn't cook in the big pan; we had propane-fired camp stoves to boil water. The breakfast was "eggs-in-a-bag", with whatever ingredients we had, tossed into a plastic bag, and then boiled until appropriately consistent. 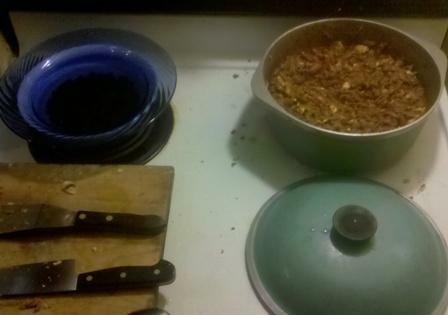 I had brought my wood-burning backpack stove, so I took a few charcoals from the troop fire and boiled my own cooking/cleaning water. Yum! 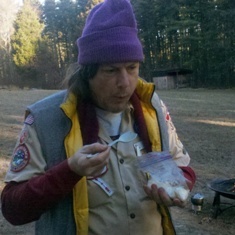 Hot breakfast, Leave No Trace way -- with no cleanup, plus a built-in hand warmer. 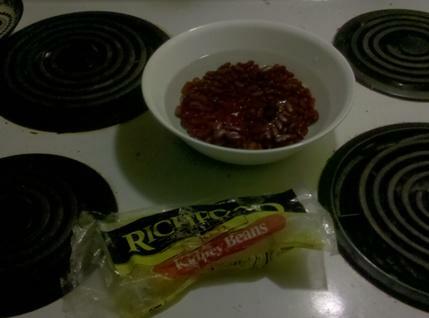 Too bad I forgot the chili powder. "Bam!" That list included an updated "Top 10" for 2009. In 2010, I visited the Bengies as much as possible, not just to see the shows, but also checking out the marquee nearly every week. Below are 28 photos of the marquee, from the operating weeks between April and November. I missed a few, but not many. On FaceBook, the Bengies admins asked "What was your favorite DouBBle or TriPPPle feature this season?" I'll avoid the easy answer of the Dusk-To-Dawn shows on Memorial and Labor Day weekend (on the grounds that those were not strictly 2 or 3 movies). I had seen Inception before, once all the way through, and once part way through (it was a Friday and I could not stay awake for the last feature). On the third viewing, Inception held up. The other 2 were great drive-in movies. I could have picked other sets just as easily, there were so many great mash-ups. And now for the top 10. As in earlier lists, I saw each of these at the Bengies, at least once, during the current year. List culled from the Bengies email service for 2010, not necessarily complete, or in chronological order, but mostly. Key: "Y" = saw it; "!" = on Top 10 list for 2010; "?" = saw part of it (or can't remember it); " " pretty sure I missed it.